Today’s Dollar and the Dudes ride began under sunny skies. 7 of us set out, with SOME people wearing jingle bells. The ride leader brought extras and had a few takers, but was forced to put the left over bells in her pockets, so she really jingled all the way home. There will be no Sunday ride on December 23rd and December 30th. Rides will return the following Sunday, with Kathy and Terry alternating as ride leaders. 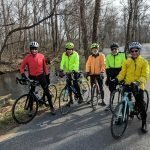 Six rode together this Wednesday to Thurmont for lunch. Allen rode his X-mas present, while Harry T. DeMoll rode for the first time in several months. Judy Goffi is hosting our after holiday party- an Italian fiesta! The club is providing food and dessert. Those attending should bring a beverage and, if they choose, a white elephant gift exchange (having a value of $10 or less). Six rode forth on Wednesday – Lynne, Allen, Rick, Wayne, Arnie and Paul – to share a lunch in Woodsboro. A windless, quasi-sunny ride, with temperature flirting with 40 degrees.